The Northern Ontario School of Medicine (NOSM) is more than a medical school; it is a strategy to address the health needs of Northern Ontarians, improve access to quality care, and contribute to the economic development of Northern Ontario. People, communities and organizations across the North had a dream that everyone in the region—no matter where they live—deserves access to quality health care. When NOSM was opened officially in 2005, the School’s first staff, faculty, community partners and students tended to the seeds of that dream, based on the vision of what NOSM could become. The Northern Ontario School of Medicine is rooted in the North. The School owes its progress in making Northern Ontario a healthier place to the many people and communities who have embraced the School’s students, supported NOSM and advocated for improved health services across the region. More than 90 communities now participate in the education of NOSM learners. 94% of NOSM graduates who have completed both their MD and residency programsat NOSM are now practising in Northern Ontario. 595 MD graduates since 2009. 135 Registered Dietitians have graduated from NOSM’s Northern Ontario Dietetic Internship Program since the internship began in 2007. “The majority of learners at the Northern Ontario School of Medicine come from the North, and many stay in the North once they graduate. Since 2011, 194 NOSM-educated family physicians are now practising in our region, resulting in better access to care for approximately 228,000 people,” says Dr. Roger Strasser, NOSM Dean. To learn more about NOSM is making an impact across the North, follow us on social media @thenosm. 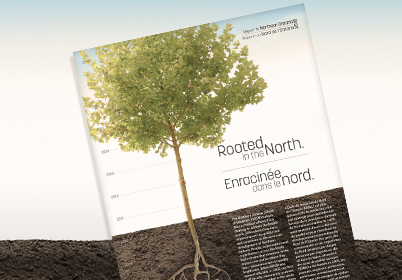 Hard copies of Rooted in the North: NOSM’s Report to Northern Ontario 2018 can be requested by contacting NOSM’s Communications Unit at communications@nosm.ca or 807-766-7452.